With the extensive coverage of 3G/4G network and Wi-Fi, the way people used to consume media has been changing quietly. Take music for instance, People are more inclined to visit YouTube for music enjoyment via video streaming rather than the traditional radio or CD, which obviously has become an irreversible trend in the current society. Having said that, the broadband is in some locations, there are many places where streaming video is impractical, or where the network is always in congestion. Having the YouTube music you like downloaded once rather than continually having to stream it would be a better option. Downloading music from YouTube might not amount to much for you. But it would also be no cinch to extract MP3 audio from YouTube video? This will be true if you utilize the ideal method to convert YouTube video to MP3 file. Here I collect the best 3 methods for Mac users to hassle-free rip MP3 audio from YouTube video. The methods and YouTube MP3 converters below are also available for Windows users and the operating steps are cast in the same mould. YouTube to MP3 audio conversion sometimes would be complicated, but it would never happen with the best yet free online converters - YouTube-MP3.org and Clipconverter.cc, which are regarded as the easiest online services for converting nearly any YouTube video (HQ, HD, 4K) to mp3. You do not need an account, the only thing you need is a YouTube URL. Applying YouTube-MP3.org to convert YouTube video to MP3 is usually a mouse click away. After you paste the YouTube URL to the blank box, slightly click the "Convert Video" button and later when the conversion is accomplished, press "download" link. Then the extracted YouTube MP3 audio file is finally stored on your computer. The steps Clipconverter.cc demanded to extract MP3 from YouTube are much of a muchness. A little bit difference between the two YouTube to MP3 online converters rests with its output formats and conversion speed. YouTube-MP3.org supports to convert YouTube video only to MP3 file with fast speed while Clipconverter.cc enables you to convert online videos to MP3, also M4A, AAC, MP4, 3GP, AVI, MOV with more time in need. 1. No need of installation any program on computer. 2. Process involving in YouTube to MP3 conversion is pretty fast. 1. Sometimes bundle with spyware or malware. 2. Cannot analyze YouTube video. 4. Input video file size is limited. When it comes to rip MP3 from YouTube video, one household name that has to be mentioned is the award-winning YouTube MP3 converter MacX Video Converter Pro, with 370+ video & audio codecs powerful enough to convert any YouTube (720P, 1080P, 4K ultra HD) to MP3, as well as AAC, AC3, iPhone Ringtone, MP4, AVI, MOV, WMV, 3GP, MKV, AVCHD, MTS, etc on Mac and PC with best quality reserved attributing to its High Quality Engine supports. Assisted by hyper-threading tech, multi-core CPU utility and hardware accelerating tech, you can easily convert YouTube MV to MP3 and directly transfer MP3 to iPhone X/8/7/6S/6S Plus/6/6 Plus/5S/C/5, iPad Pro/mini 4/Air 2/mini Retina, Galaxy with solely 30 seconds. The reason why it overshadows others to become the best YouTube MP3 converter for Mac 10.11/10.12 and Windows 10 also lies in its multiple roles that functions seamlessly as video downloader, audio converter, video transcoder, slideshow makers, video editor and on-screen video recorder. Hence, with this versatile converter, you can convert whatever video you desire and do whatever multimedia activity you expect. Step 1: Free download and run this YouTube to MP3 converter on Mac. Then copy and paste the URL of YouTube video to the type box. After you click "Download Now", the rest audio downloading job will be automatically done by this tool. Step 2: Access "to Music" and simply choose the MP3 format from the drop-down window. Step 4: Hit "RUN" button to start to download and convert YouTube to MP3. YouTube, as known to all, contains some non-downloadble videos, which are only playable online. What if you want to save YouTube video in MP3 as your ringtone or playback on portable device? Then the all-round YouTube audio recorder takes the spotlight and allows you to record the non-downloadable YouTube video with its impressive on-screen recording feature in 1:1 lossless quality. After faultlessly recording the YouTube video on Mac 10.10, you can finally convert the YouTube to MP3 file format for your personal use. Follow the guide below to record YouTube as MP3. Step 1: Run this superb YouTube to MP3 recorder and press the "Screen Recorder" button on the main interface. Step 2: Adjust capture settings by choosing "Keep Full Screen" or "Crop Region". Moreover, before you capture YouTube video, you can select the quality of video to be recorded, tweak the video frame rate, add sound effect to your video, and alike. Step 3: Click "Target Folder" button to select a destination folder and save your recorded YouTube video. Step 4: Hit "Start Record" button to start capturing YouTube screen video at its best. This article introduces the ultimate solution to download and convert YouTube video to iMovie compatible format. With this YouTube to iMovie converter, users can easily make videos downloaded from YouTube on iMovie (iMovie 10.1.4 included). 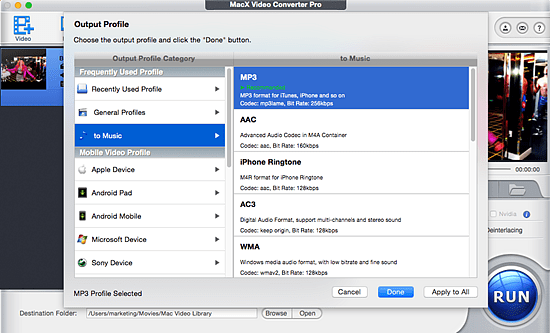 MacX Video Converter Pro is the best YouTube MP3 converter, which can easily convert YouTube videos to MP3, AAC, AC3, and other video formats such as YouTube to MP4, AVI, WMV, MKV, MTS, MOV, etc, along with excellent YouTube video download feature.